Who would you be if your life was not shaped by critical inner and outer voices, habitual thinking and actions, and negative attitudes? What would your life look like if you could live your life in from moment to moment with greater connection to yourself and others? What are Deep Listening Sessions? Deep Listening Sessions are one-on-one sessions designed on each individual person's growth needs and learning curves. These sessions are ideal for people wanting to work on self-connection, old beliefs and habits that do not serve life any longer, old pain and trauma, and inner resource building. These are sessions based on deep listening, and principles of compassion, growth, and healing. In these sessions, each individual is as as "un-divided" -- each part of you is important. Thus, these sessions focus on body, mind, and spirit, and aim to tap into each person's individual capacity to heal themselves. The core focus comes from you. I offer facilitation, listening, and when needed, intervention and tools. Sessions are 60 minutes long, and will include small bits of work to take home. While one hour is ideal, if something is very heavy, time- and resources- willing, I may suggest slightly longer sessions in some cases. I may also suggest strategies and tools to work on yourself. At the same time, these sessions are shaped largely in accordance with what you need. No two sessions are the same because no two people are the same. What are the benefits of Deep Listening sessions? Couples in need of mediation and listening from a third party, or families needing some support, may also get in touch. 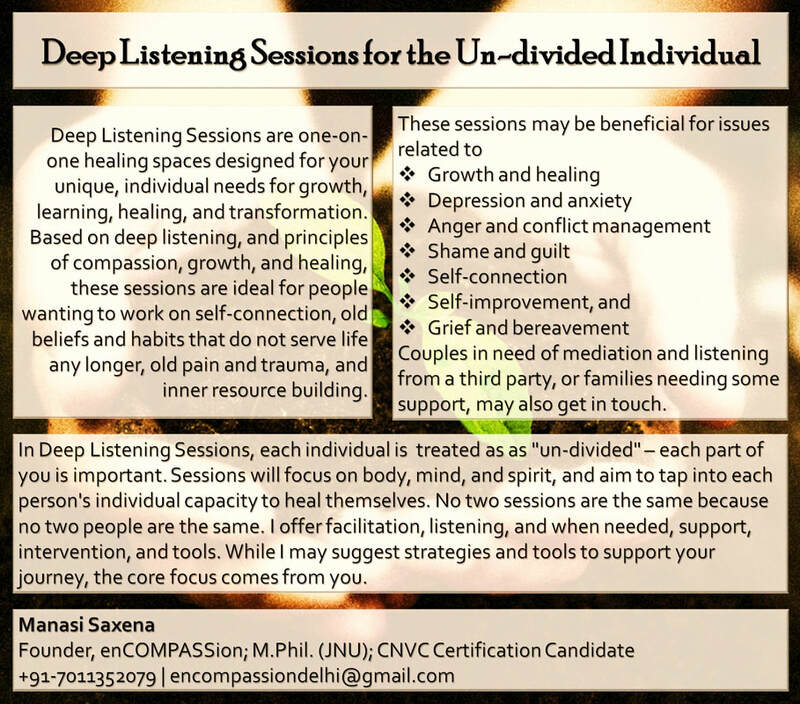 These sessions are called "deep listening" because these sessions offer a space to express yourself with some guidance towards connecting deeper and deeper. So much pain remains trapped in our bodies, minds, and spirits, because it remains unspoken and unheard. This trapped negative energy can manifest as shame, anger, depression, guilt, and also in the physical body. Everyone has feelings and everyone has needs. Many of us are no longer able to connect with feelings and needs because of our education, conditioning, circumstances, and choices. Deep Listening Sessions can help improve your ability to clearly connect with, and express your feelings and needs. Expanding your emotional vocabulary can help you to stay away from blame, criticism, and entrapping life choices that keep you stuck in negative, life-alienating spaces. When pain is not expressed, energy often gets trapped in different parts of our conscious and unconscious worlds, whether this is physical, emotional, mental, or even spiritual. Working with gentle self-acceptance, Deep Listening Sessions help to connect with feelings and needs, offer tools for self connection in trying times, and experience and go through emotionally charged situations with compassion to heal and shift away from old pain. Habitual patterns -- such as reacting with aggression and criticism, or turning with violence towards yourself and others -- can lead to pain, conflict, and alienation. We may focus on looking at the heart of these patterns to understand where they come from, and look at doable ways to shed these patterns that no longer serve our lives. How is Deep Listening different from Therapy? While the empathy and suggestions offered in Deep Listening Sessions may be therapeutic and releasing, these are not psychotherapy, and are not intended as a substitute any other healing modality. Deep Listening Sessions are also not a coaching space, where I will give you answers. Both the questions and the answers come from you. Deep Listening Sessions offer facilitation to shift consciousness towards where these answers lie within you. Again, each person is different. Deep Listening Sessions aim to honour that difference and individuality, and remain focused on growth and learning needs.